Evergreen trees decorated with lights, garland, and ornaments have become a staple in most households that celebrate Christmas, however, these trees haven’t always been a symbol of the upcoming holiday. Since evergreen trees stayed green throughout the cold months, they have long been revered. Ancient Egyptians worshipped the god Ra and believed that Ra grew sick each winter. Each winter solstice, the shortest day of the year, Ra began to recover from his sickness. Egyptians decorated their homes with greenery to celebrate Ra’s triumph over death. Similarly, Romans found plants that remained green all year and decorated their homes with evergreen branches to honor Saturn, the god of agriculture, and celebrate the approach of Spring. The Christmas trees like we see today didn’t arrive on the scene until 16th-century Christians started the tradition in Germany. Christians would either bring a tree until the house or build a wooden pyramid and decorated it with evergreen branches when wood was scarce. German immigrants would eventually bring the tradition to North America, decorating the trees with nuts, fruit, and marzipan cookies. It is debated why Christians adopted the pagan tradition, but stories say that Martin Luther was the first to put candles on the trees. He was walking late one night and was stuck by the beauty of the stars twinkling through the branches of an evergreen. He shared the magnificent sight with his family by bringing a tree into the house and placing candles in the branches. Christmas trees were not widely accepted in American at first due to the Puritans’ strict rules on celebrating the winter holiday. Christians started celebrating Jesus Christ’s birth when Pope Julius I chose December 25thfor the Feast of Nativity. It is believed that this was chosen to coincide with the pagan celebrations of the winter solstice to more easily convert pagans to Christianity. The popularity of the December holiday spread by the eighth century, but how the holiday was celebrated varied from country to country. Fast-forward to 17th-century Puritan Christmas reform, when Oliver Cromwell and his allies took power England in 1645 and, among other things, canceled Christmas due to its pagan roots. The holiday was restored when Charles II again took the throne, but the Puritan animosity towards the holiday endured and spread to the New World. 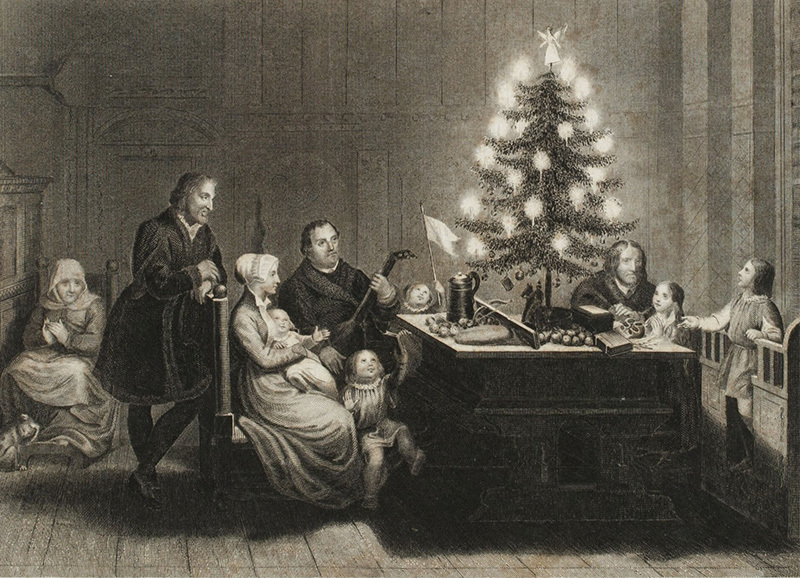 Pilgrims in New England, under the governance of William Bradford, honored the birth of Jesus but found any frivolity or pagan symbolism, such as the Christmas tree, as sinful. In Boston, Massachusetts, any observance of the holiday other than attending church was against the law from 1659 to 1681. Queen Victoria and Prince Albert are sketched for the illustrated London News with their children next to a decorated tree in 1846. Celebrating Christmas and decorating trees did not become popular again until the Victorian era. 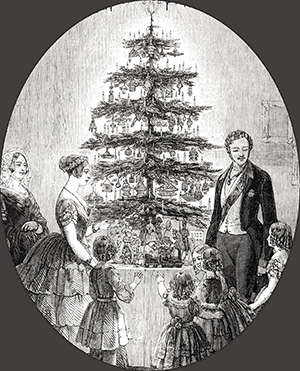 England in 1846, Queen Victoria and German Prince Albert were sketched with their children around a decorated tree. Due to the Queen’s popularity, decorated trees were relevant again. Despite Puritan sentiments on trees, German immigrants in America continued to decorate trees and the practice of ordaining evergreens became a tradition in many American homes. Since the mid-1800s, blown-glass ornaments have replaced fruits or nuts and electric lights have replaced candles. Trees now sit in store windows and giftsplaced by Santa Claus surround the trunk. Yet these evergreen trees, in a way, still stand to celebrate life in the harshness of winter as they once did forEgyptians and Romans. 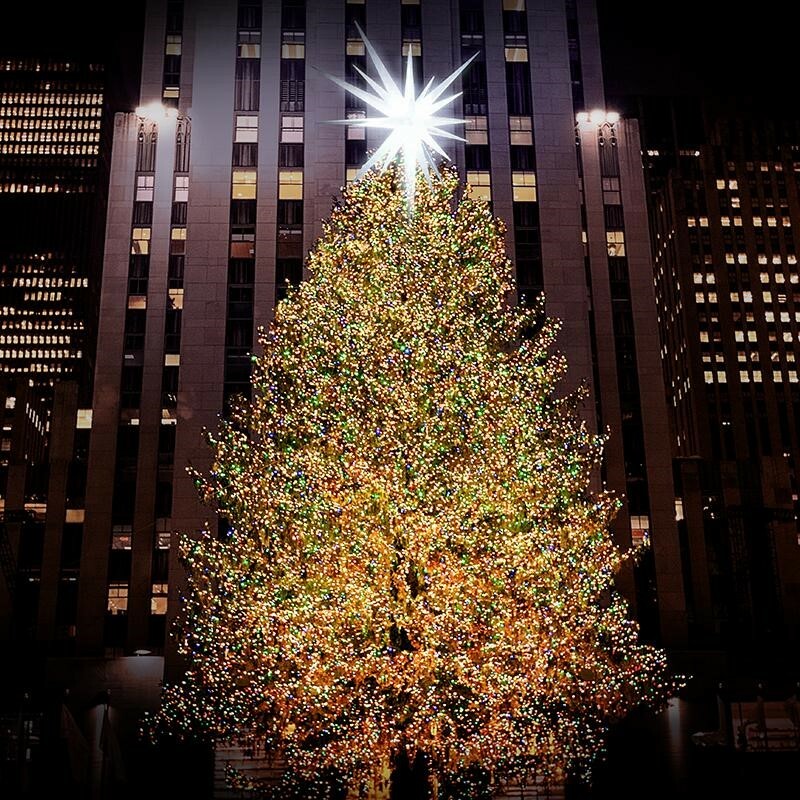 2018 Rockefeller Center Christmas Tree lit in New York City. Interested in what women were wearing when Queen Victoria and Prince Albert made Christmas trees popular in London? 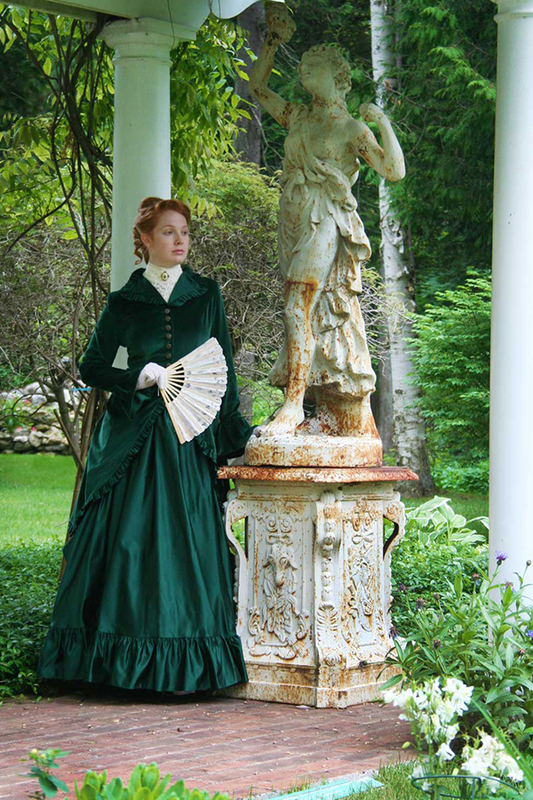 Check out Recollections’ Victorian Era dresses and gowns. Great article! I knew most of the information about the history of the christmas tree but the martin Luther part was new.